2. In large bowl, whisk eggs, milk, salt and pepper. Add egg mixture to skillet with potatoes; cook 2 to 3 minutes or until eggs are set, stirring occasionally. 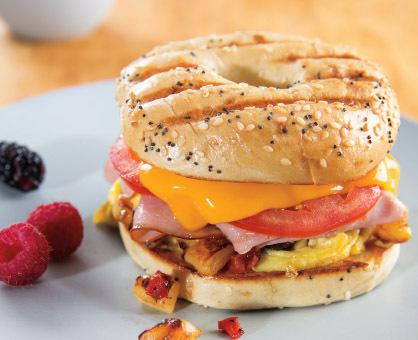 Spoon one-quarter of the egg-potato mixture onto bottom halves of each bagel; top each with 1 slice ham, 1 slice tomato, 1 slice cheese and top half of bagel. Spray both sides of sandwiches with nonstick cooking spray. 3. In batches if necessary, cook sandwiches 6 to 8 minutes or until bagels are golden brown and cheese melts, turning once and pressing down occasionally with large spatula.